If it is a rock, it is a pretty weird sort of formation. 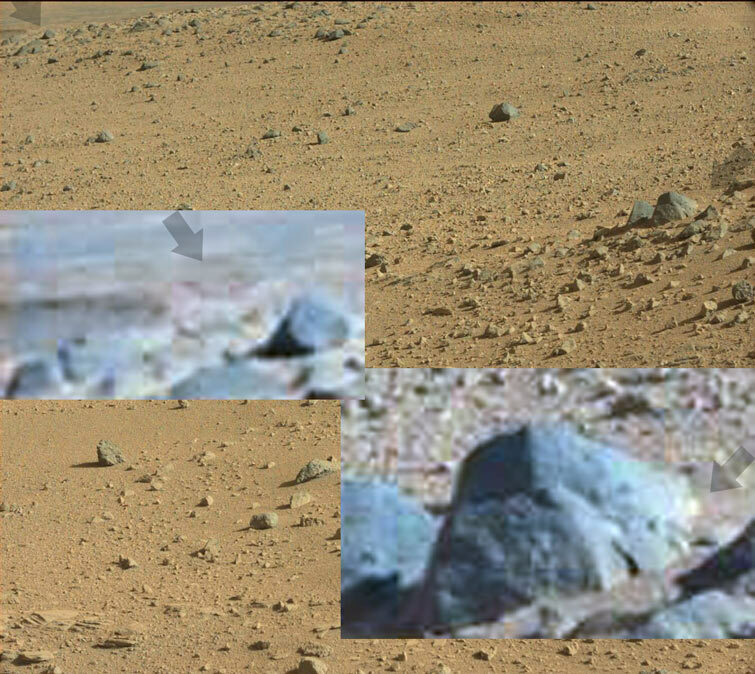 Hmmm, l thought that the one with the root growing out of the rock, may have been legit, but unfortunately going by the video, l don't believe so. On closer inspection most of it is Curiosity and the surrounding background, (the blue sky, was the giveaway) being reflected back. 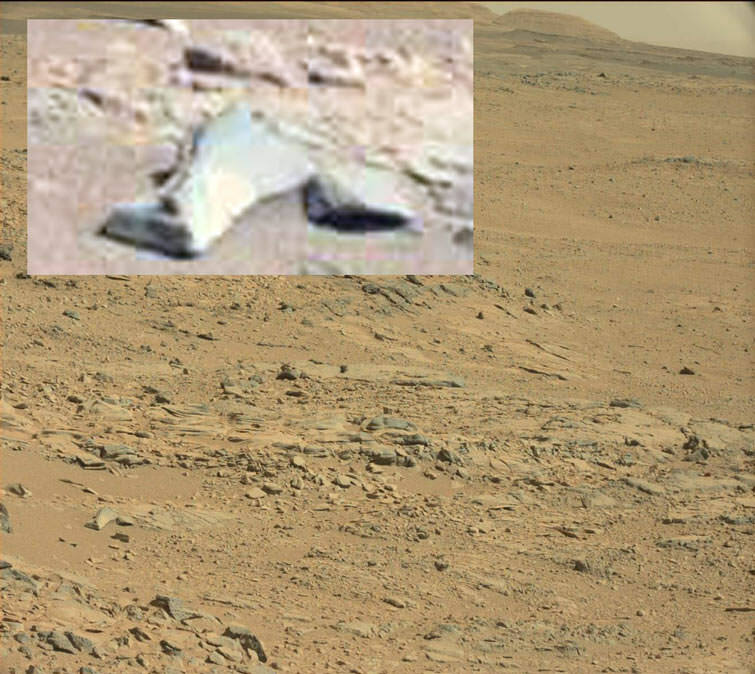 And the other, the rock that looks like a knife, is compelling, and could be legit. I have certainly found things that look like ancient pots, and carvings, etc over the years. Dry creek bed, l think? Collapsed metal, ornate box? Probably not. Looks like a partially collapsed jetty at the side of a dried up creek/wadi. I don't see anything to give it scale though. It's amazing NASA seem so uninterested in some of these formations. It is probably 10 or so metres away, (best estimate) so it is the size of a treasure chest! Yes, Curiositys wheel tracks go right past this, but nada. But l have seen, (video, water flow, first post) Curiosity get within a few metres of water flowing down a hill, and instead of front page news, nothing, (this was years before the so called water on mars announcement). NASA's current mission statement is to show what Mars really is, but do it in a Not Hold up in Court kinda Way. So the ones that don't want to believe in anything can continue to do so, and the ones that aren't numbed down by society, can continue to discover the truth. But in the year 2033, when oil supplys are becoming less reliable to too costy to extract, then the big announcement will be shown. But even if newspapers everywhere say, NASA Finds Martian Monolith on Mars Moon, with HD images, it probably won't convince some. Some will just attack the newspaper for false information or NASA themselves, usually aggressively, l have seen this insanity elsewhere with recent scientific discoveries. Being insane, and attacking won't make the fact disappear, but will make them look like idiots or lose what credibility they had left. So l expect a small minority to go 100% insane or be in 100% denial when that announcement arrives. But l suspect members here will be saying "cool" or "about frickin time" and then cool, lol. Ok, l will blow that up next time, but l didn't see anything interesting on that, apart from the usual green, and possible traces of recent water flows around it! Curiosity throwing up some dust, l think. Something that looked like a martian lizard, (but unlike others on Youtube, l can state that this is a reflection). The bottom one is another example of a yellow sun during the day, (just like us, expect 40% smaller). 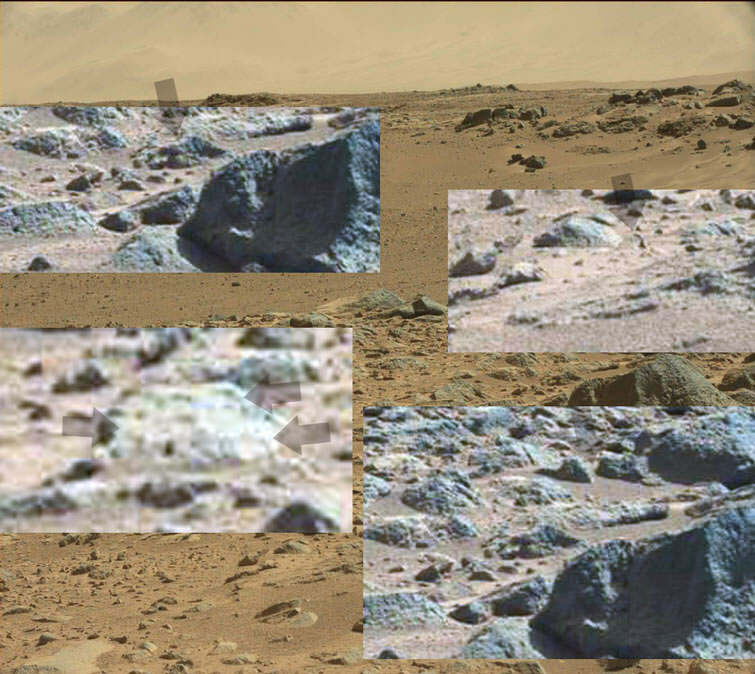 Unfortunately the rock looked interesting as it is mainly reflecting the rover back to us. Many claimed anomalies are pretty pathetic, but take a look at this video between 6:06 to 6:43. This anomaly is close up in pretty sharp focus. It certainly looks like something cuboid and a disc in the top layer of the regolith. Yes, pretty good, but it isn't a perfect rectangle since part of it is connected to the left part. But l agree that most claims are pretty stupid, especially on Youtube. Unfortunately the video's that are the most pathetic, go to the top of the search results, and the legitimate ones are harder to find. YT has made a deal with the US gov, to be able to strip the keywords off any video they choose, so the kw, will remain but be next to useless to go to the top of the heap. That is why some YT account holders pushing the truth resort to using non related kw's so they can get to the top indirectly. And more good examples of why Mars has an orange/yellow sunset like we do on Earth. No, bluesh sun in the first image, but it gets better. This one seems to show an orange sun, or sunset, but l believe that the sun is reflecting off part of Curiosity, (but it is still not blue, so). And this,....which l believe to be a orange sunset, with a pink sky and a green landscape, reflecting off the rovers mast cam. Considering the distinction areas, and obvious colors, this is a massive contradiction of supposedly genuine images of a sunset with a blue sky and sun. But you wouldn't expect anything less from NASAF! Gerbet tent???? You might have the wrong thread? The thing on the top might be another bridge, very hard to gauge distance, but it is unlikely to be natural. And another image of the sun setting, l ran this through Photoshops color picker, and green to lime green with a hint of yellow was all l could pick up, (no blue). So when NASA shows a blue sky and blue sunset, it is inaccurate or an outright lie, as most of their Mass Media data is! 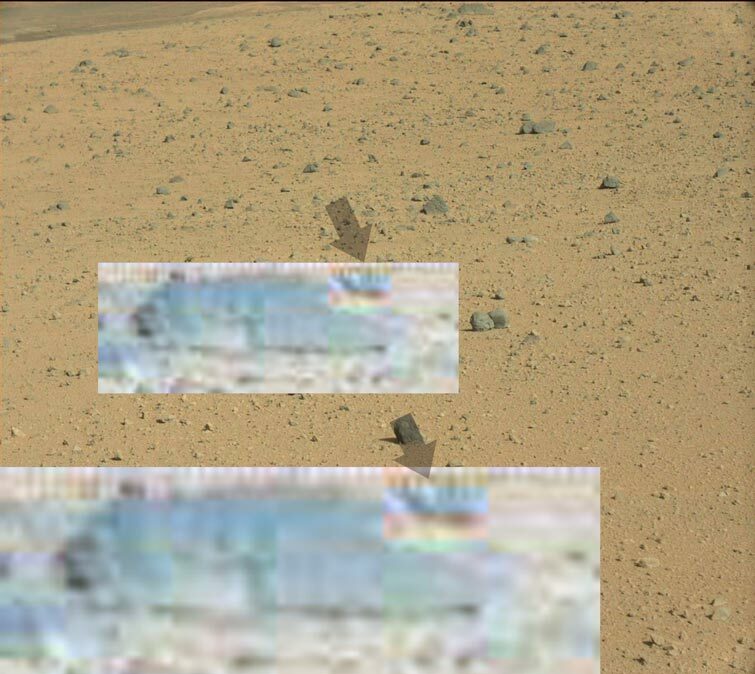 Bottom arrow, middle shows Curiosity's reflection again, (one of its wheels on the right it visible). And the red arrow? Since the rovers turrent is in the middle, (the middle of the white thing) this should not be here. And yes, it does look remarkably like a grey smiling back at us, (so much for the evil, take us away for experiments crap). Seems that the locals can't resist a selfie, lol. 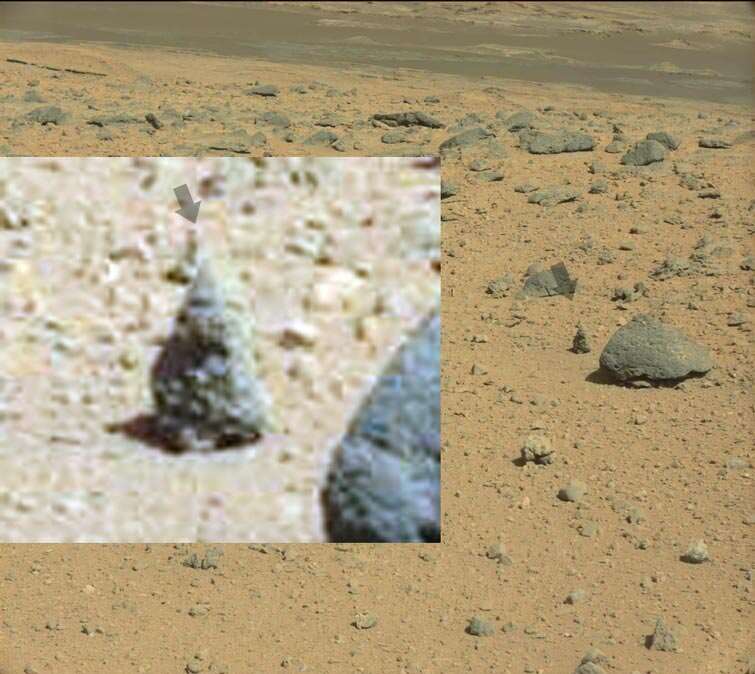 Garden Gnomes on Mars, nah. A dirt road, and green tinges on the rocks, sure. More water flows on Mars. And from the left hand image, rain clouds, (you can see the blue sky, here and there, and the dust devils across the landscape). And just see Curiosity's camera mast. 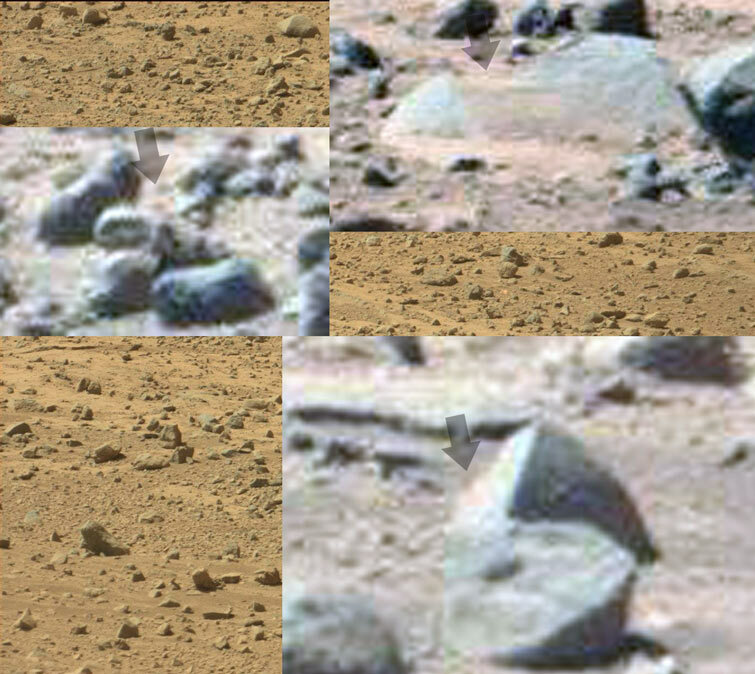 Another rock showing Mars Sun, and not surprisingly it looks like our one. Top one is the side of Curiosity reflected back to us. The last one is a rock. And the middle, phew, thanks for posting that, pretty much sums up, that NASA keeps away from anything that dispells the myth that Mars has or always has been devoid of intelligent life. By all rights this should be impossible. Best guess that this is a rectangular sheet allowing some of the background landscape through, but it still reflects parts of Curiosity that cast a shadow or stand out. I don't believe that it is a woman, but a sheet of glass like material. I am not a biologist, but it is very unlikely to impossible that nature did this. And very likely that Mars has had a civilization in the distant past. And likely that they are still there. Unfortunately we will probably have another 16 years of NASA lies, and people that will believe it all, until it all comes out. 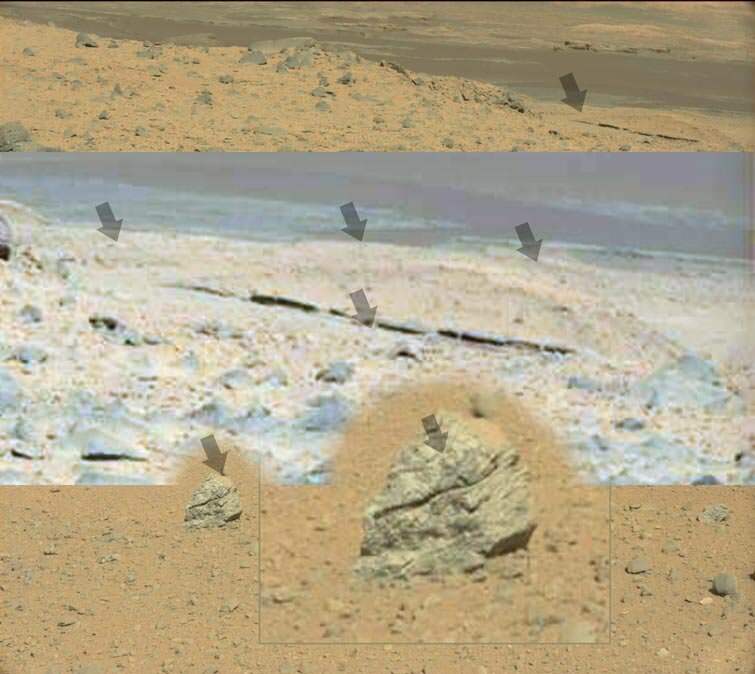 I am pretty much convinced NASA's "Pinnacle Island" item that just happened to turn up by the Rover and has an unusual chemical signature is NOT a rock and is probably some type of fungi or a Mars equivalent. 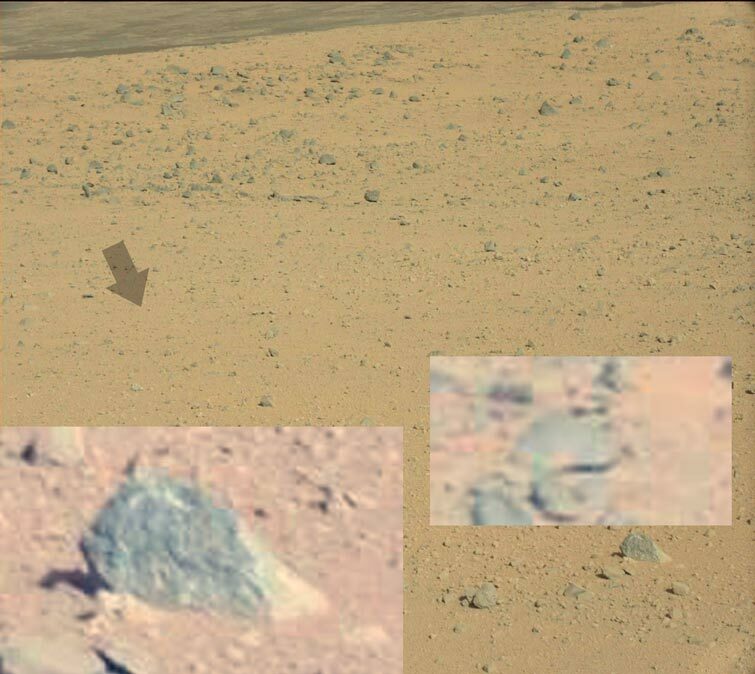 I had noticed myself, as the above site does, that before the "rock" appeared suddenly out of nowhere there was a shape in the ground that was similar to the outline of the "rock". What are the chances of that? I would call this the smoking gun. That ain't a rock. That's life. Yes, this is the second time that something popped into the image frame. 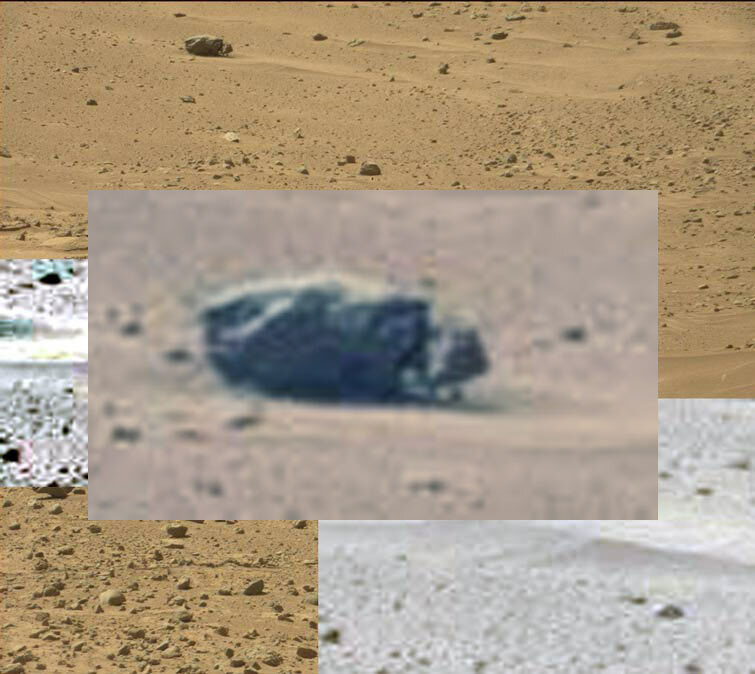 First time NASA claimed that it was on the rover and fell there, (similar to this) but really? 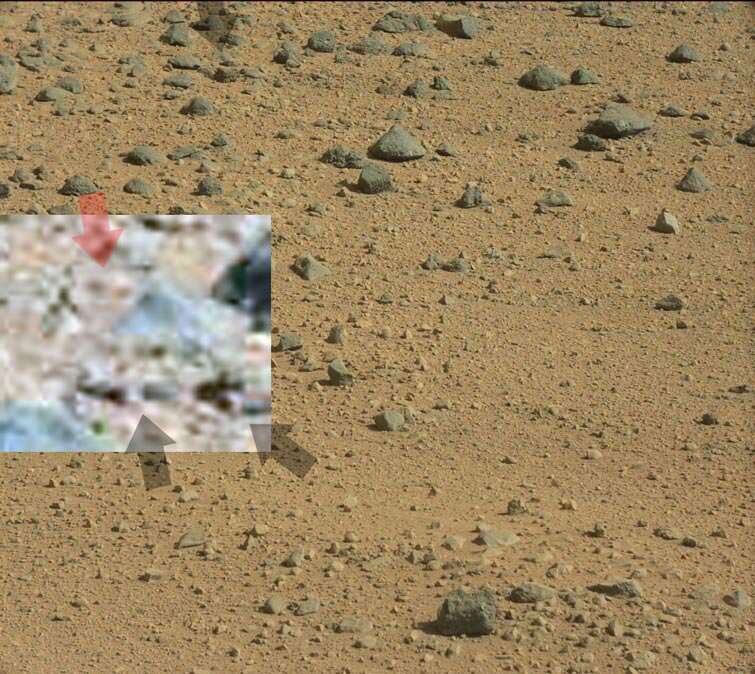 Spirit and Opportunity have been driving about on Mars for 10 years each, and Never had something pop into frame from no where. NASA will never admit that Mars is earthlike and is currently inhabited. And as l have shown it is regularly visited by the locals, so no surprizes, especially with the BS, that some will move stuff about. Hubble keeps showing blue skys and green stuff, that changes with the seasons, and even a great lake system. But Spirit and Opp, show no blue sky, (one big warning bell) and Cur, show the blue sky on rare occasions, but 99% are red. NASA lies are pretty obvious, but the number of numbskulls out there, that refuse to see this,....pffft, too numerous to mention, and the more you try, the stupider the replys. 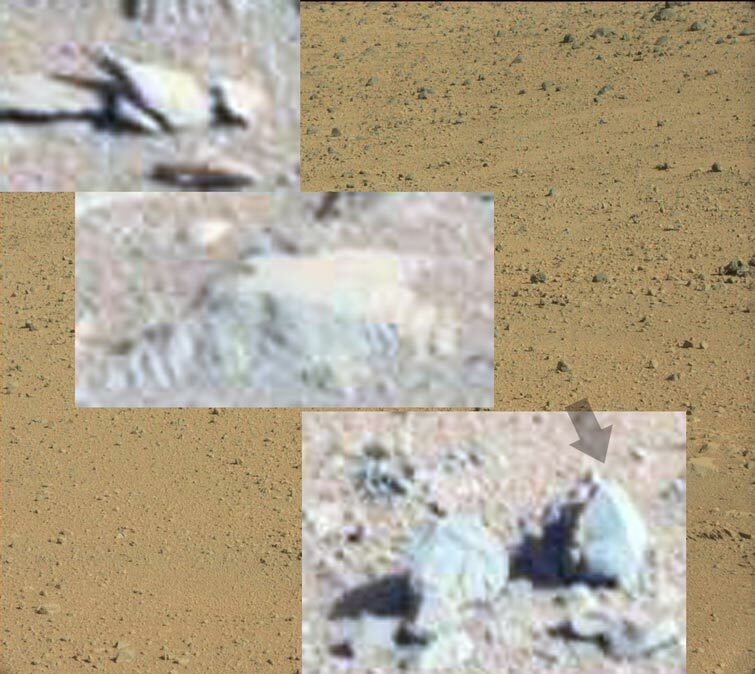 Believing that Mars is earthlike, and harbours at least three different life forms as we speak, is pretty spooky, but as the occasional reflected image l find of usually a grey taking a closer look, (sometimes a family) it isn't. It is just that we have seen too many hollywood movies. First, a representative from NASA pointed out that NASA has no interest in hiding anything. If life were found, that would be the greatest discovery of all. NASA would have no trouble getting funding, so why would they hide it? Second, I've seen this image before. Look at the "before" image. There's a depression in the rock exactly the same shape is the "object". This isn't a rock, it's salt. It grew up out of the rock. 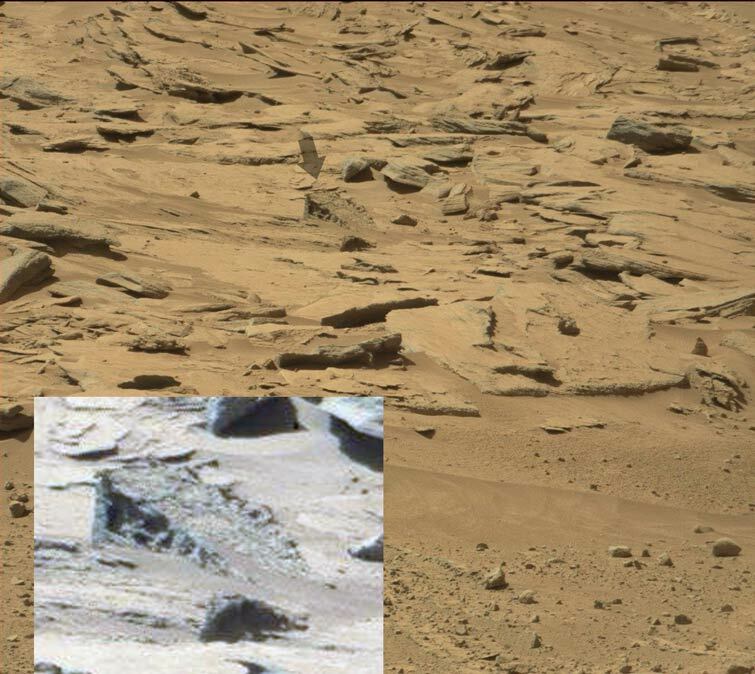 Lithotrophs on Earth are often associated with metabolism of sulphur (and the "rock" is giving off a strong sulphur signal according to NASA)...they are often extremophiles, so able to survive Mars-style surface conditions...might there be a link here? I agree with you about the depression in the rock. How could NASA not have noticed that? According to NASA the "thing" got kicked there by the Rover's wheels, and just happened to land on a depression that matches its shape! Yes, l know, had this point before, but expose that and free energy gets exposed, (magnetic repulsion) and 100 trillion, in oil profits go with it. Not to mention militiasing antigravity. NASA, (which is owned by the military) isn't going to show the truth, for more funding when it will crash the stock market, and make this world, go down the put a nuke on a UFO, and send it to New York. NASA has no interest, lol, total BS. 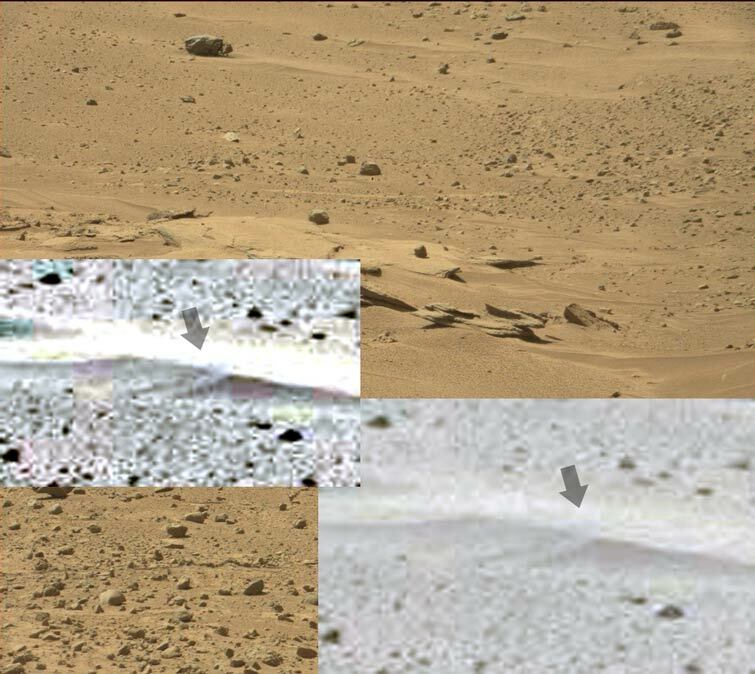 Curiosity drove within a few metres of some water flow in Mars years ago, (shown in my video) but nothing. All we got was some lame example of a trickle of water down a crater wall Years later. No NASA has been suppressing this since Viking, 1977, since back then they were more worried about scaring the population than anything else, with Vikings readings of organics in the soil, and a blue sky and the green stuff on the rocks. Hubble keeps showing blue skys, even with a thicker atmosphere than ours on Mars, and we keep getting the stupid red skys, and everything else on the surface. Yeah, l know, NASA says it is hard to get the color right,....hard to keep BS plausible. The Russians had no color issues on Venus, and NASA had no issues with the moon around Saturn, (hygans probe). NASA will actually spill the beans, but not now, not with 100t in oil at stake, and millions of jobs, etc. In the year 2033, when they send a few atranauts to Mars and they land on one of its moons, with the monolith, and oil is getting harder to unearth, then we will finally get the truth!